For many years surgeons have been able to inject patient’s fat cells into other parts of their body. A typical fat injection procedure involves removing the fat from unwanted areas, processing the fat, and then reinjecting into an area such as the face, lips, or buttocks. Progress has been made gradually over the years, and the micrografting techniques pioneered by Sidney Coleman have stood the test of time. Fat has been injected reliably into areas that were thought to be impossible. One of the newest frontiers for fat injection is irradiated tissue in the breast. After cancer diagnosis and mastectomy, many women undergo radiation therapy. Breast reconstruction is either the choice of a free flap (breast made from your own tissue) or breast implants. It has been our well documented experience that putting implants in irradiated tissue is fraught with complications, so implants are often not a good option. This is because irradiated tissue is damaged, and the blood supply does not work as well as in normal tissue. The preferred mode of reconstruction has been vascularized tissue, that is tissue that has its own blood supply. This type of breast reconstruction following the cancer removal is referred to as a free flap or a tram flap. Bringing in a piece of tissue with its own blood supply for a reconstruction makes sense when you need a lot of tissue, as when a mastectomy is done. 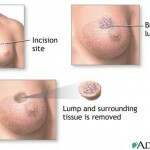 A total mastectomy is the total removal of the breast tissue. Instead of getting implants for the breast reconstruction, some women undergoing a total mastectomy can have a breast made from their own vacularized tissue–a tram flap or free flap. But what about the case of a lumpectomy? Lumpectomy patients only have a small portion of the breast removed because their cancer is not widespread. Thus, they are left with one breast smaller than the other. However, they are not really candidates for free flaps or tram flaps. Up until recently, reconstruction choices for lumpectomy patients were to either leave one breast smaller or place a small implant in the one breast. There is now an additional choice to reconstruct the smaller breast with fat injections. The fat is extracted from the patients stomach, flanks or thigh areas , processed in a special technique , and then reinjected into the breast. Originally I was skeptical when I heard you could inject fat, without its own blood supply, into an irradiated breast. And yet…It works! Not only does it work, fat injection to the breast works better than I ever thought it could have. The reason is that this injected fat plays a role in healing the irradiated tissue. The research shows stem cells within the fat cell population have a role in regenerating and restoring the tissues. The breast not only gets a reconstructed shape, it is literally rejuvenated by the fat cells. I am very hopeful about reconstructing patients who have had a lumpectomy for cancer. This is a great advance that will give great results. I have already started incorporating this fat grafting technique for lumpectomy patients into my practice. Fat grafting to the breast is a great alternative to an implant! Right now it can only be done as a clinical trial. There are only a handful I know of in the US that I know of. Mine is one of then and it is a month or two from initiating. She can have good results from fat grafting, if it is done by someone who is knowledgeable and experienced in it. I don’t know of people in your area, but it does not mean there aren’t surgeons there who can do it. Read a little bit about it here and here so you’re informed when you ask questions to the surgeon. My wife had a lumpectomy with a good result but a small dimple, interested in stem cell technique, do you know if anyone in the Charleston, SC area does it? Fat injection to the breasts is highly technique dependent. I also do research on fat viability and have been invited to teach surgeons in Armenia, Argentina, and Honduras. I was wondering how successful fat injection into the breast is. I have fibrocystic breasts. I am also a mother of two and breastfed. My breasts are limp and lifeless. Though my husband says it doesn’t bother him I know it does as I frequently find him looking at women with nicer breasts. I would like to have this done, yet would also like to know more. What is the cost and risks? The FDA looked at the matter of Silicon and autoimmune problems very exhaustively, and found no link. If you want to explant, I can understand it, but please do not do so out of misplaced fear. It is appropriate to worry about your health, but I do not think the implants are related to your immune problems, as the FDA has looked into the issue and I trust their findings. It is impossible to know if you will be flat chested unless I was able to examine your breast. I do think fat injections would be great in your case. As you may or may not know, fat cells have an immunemodulatory effect, that is, they can calm down the immune system. Have had implants for 22 yr. Now have vitiligo now on my left eye and it’s trying to move to right eye (2 yr. now), dry eye syndrome for years, and lately dry mouth. Not positive, but could be due to implants. Want to explant, but would be left completley flatchested. I don’t want anymore implants. Would fat injection procedure work for explanted breasts? thanks for your help. I am worried about my health. I’d be happy to see your equipment. My name is Daniel kyung and I’m a CEO of, P&C International-North America. After reading the page you have wrote, I do very much agree on your findings. Our company have a machine that will improve your practice of Adipose Derived Stem Cell treatment. Please allow us to send you literature of our machine for your review. The office is closed until Monday, but Kelly will contact you on Monday. Call me I want info.